Aren’t pickles fun? They’re such a great way to preserve the harvest, plus they’re a place to experiment with flavor combinations. Not to mention, pickles of all kinds make great snacks and accompaniments to meals. Here we explore two very different ways to turn vegetables into pickles: lacto-fermentation and vinegar pickling (with a hot-water bath to preserve them). We don’t stop with vegetables though, read on to discover some of the unconventional morsels we like to throw in the pickle jar. According to the Merriam-Webster dictionary, a pickle is “an article of food that has been preserved in brine or in vinegar; specifically : a cucumber that has been so preserved.” The origin of the word pickle is a little murky. In fact, it’s been postulated that it may be the last name of medieval Dutch fisherman who came up with the process. But pickling has been around much longer than that. According to an article from PBS, people were pickling cucumbers in the Tigris Valley in 2030 BC! Wherever there are seasons of bounty and of lean times, human beings have made pickles to help get them through. Vegetables are by no means the only foods that get the pickle treatment. However, cucumber pickles and sauerkraut (lacto-fermented cabbage) may be the most popular. Both limes and green mangos are very common fruit pickles in India. Meat can be pickled too. For example, corned beef, pickled pig’s feet, and herring in wine sauce are examples of this. Even whole, hard-boiled eggs can find themselves floating in brine. Feta is a common kind of cheese that gets pickled in its own tangy whey, plus generous salt. 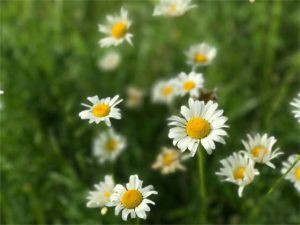 A few of our favorite unconventional pickle ingredients: oxeye daisy buds and flowers, milkweed pods, garlic scapes, hemlock tips, daylily buds, basswood leaves, and wild mushrooms. Using vinegar or salty brine are two of the most common ways to pickle. In the case of salty brine, beneficial bacteria eat the sugars in the vegetables on their way to becoming pickles. As a result, lactic acid is released, turning the saltwater into an acidic solution; this process is called lacto-fermentation. For vinegar pickles, salt is almost always added too. So, what’s the difference between these two sour-salty solutions? 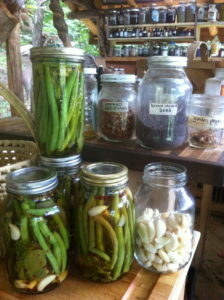 The presence of probiotics, or beneficial bacteria, is the main difference between lacto-fermentation and vinegar pickling. Lacto-fermented pickles are cultured, and full of priobiotics. Additionally, sealing vinegar pickles in a hot water bath is very common. When we do this, we cook both the pickles and the brine. As a result, we can store the pickles at room temperature in their sealed jars for a long time without spoiling. Check out our infographic below for a comparison of some of the pros and cons of these two ways to pickle. Pickle diversity is as vast as human culture. Here are two basic recipes to get started, from two awesome books on food preservation. There are tons of other pickling books out there. We especially encourage you to explore recipes for pickles and preserves from India, Ukraine, Germany and Japan. Those are among the pickle loving cultures who have perfected many piquant delicacies. When you deem it done, pack into clean jars and store in the refrigerator. Wild Fermentation by Sandor Ellix Katz. 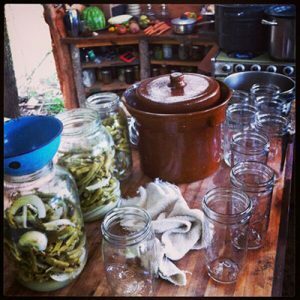 All about fermentation, from grain to dairy to vegetables and beyond…not just pickles. Putting Food By by Janet Greene, Ruth Hertzberg, and Beatrice Vaughan. 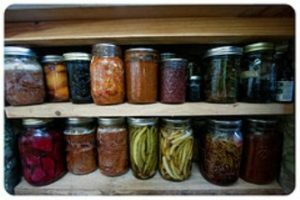 The classic guide to food preservation. 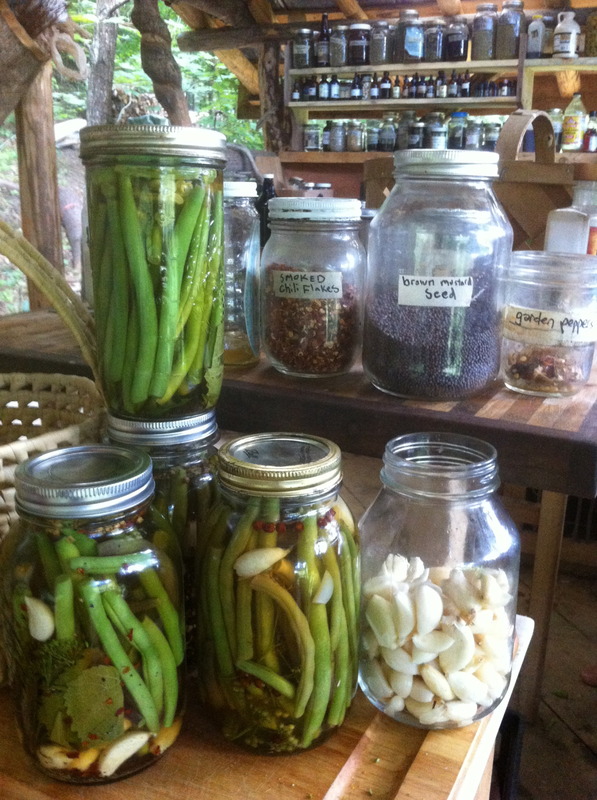 Focus on vinegar pickling, canning, freezing, etc. Fermented Vegetables: Creative Recipes for Fermenting 64 Vegetables & Herbs in Krauts, Kimchis, Brined Pickles, Chutneys, Relishes & Pastes by Christopher and Kristin Shockey. A fun and inspiring recipe book full of delicious ferments. Ball Complete Book of Home Preserving: 400 Delicious and Creative Recipes for Today by Judi Kingry and Lauren Devine. From the company that makes a popular brand of canning jars, recipes for vinegar pickles and more. 5 Liter Crock with weights, airlock lid, and pounder. This is for putting away large batches of fermented veggies. “Easy Fermenter” airlock lids for mason jars. This starter kit includes recipes and a hand pump to exclude oxygen from your pickled as they ferment. Making smaller batches of pickled things in mason jars means you can have more variety, plus you don’t have to scoop your pickles from a large crock into jars for storage, just switch to a normal lid once the pickles are done.